Mmmm. Peanut Butter. So good, and so simple, yet most people buy it already made and full of salt and preservatives. Hold on to your hats, ‘cause today we’re making peanut butter with just one ingredient: Peanuts. 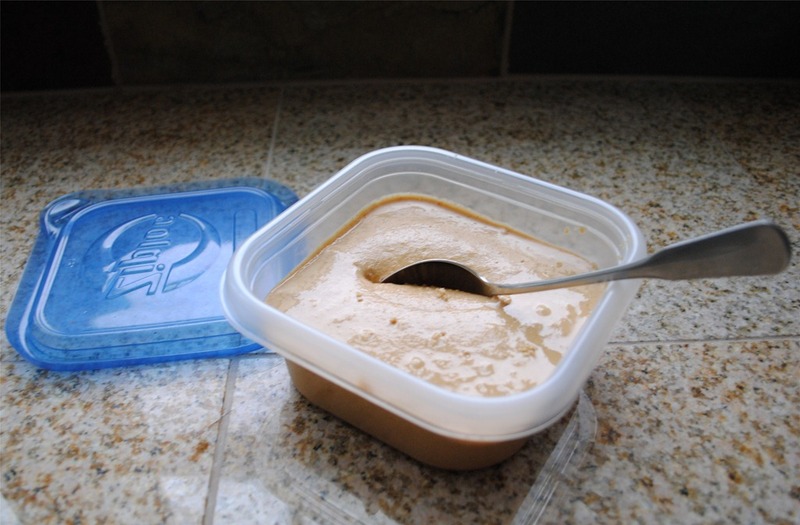 In roughly 3 minutes, start to finish, you can have fresh peanut butter, and it is so simple you won’t believe it. This would be a good project to have the kiddos help with, because it’s kind of fun to watch the transformation. First, we need our ingredients: 16 ounces (that’d be a pound) of unsalted shelled peanuts. You can use salted peanuts too, but I prefer the no sodium aspect of unsalted. Safeway had a sale on peanuts recently for 2 for $4.00 on Planters, so that’s what I have. You can probably find them even cheaper in the bulk section or at Trader Joe’s. Note: if you want, you could add 1-2 tablespoons of a nuetral oil during the blending process to make the peanut butter super creamy. Depends on your tastes and if you’re concerned about calories. 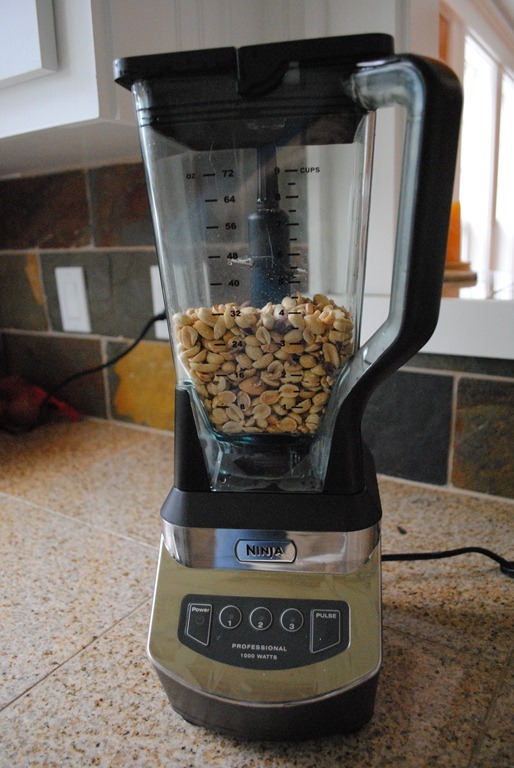 Pour the peanuts into a high speed blender. If you only have a food processor, it will work too, it’ll just take a little longer. 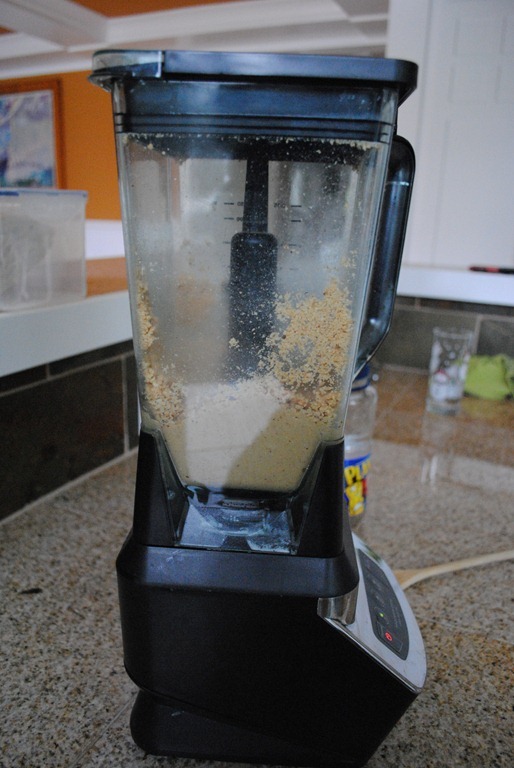 After a couple of minutes, stop and push down any peanut dust that isn’t getting incorporated before you finish blending to make sure none goes to waste and then resume blending. Blend until you get a thickness you like. It will thicken up more the longer you blend it. Voila. Peanut butter in three minutes. Finish it off by scooping into a very fancy container and storing in the fridge or pantry. You can see I went with something super high end. Pour 16 ounces (or more) of peanuts into a high speed blender or food processor. And, that’s all there is to it. I admit to licking the spoon. A few times. Please don’t tell 2Chili I double-dipped! i am so making peanut butter this week. or, actually, once i run out of the store bought variety we have in the pantry. 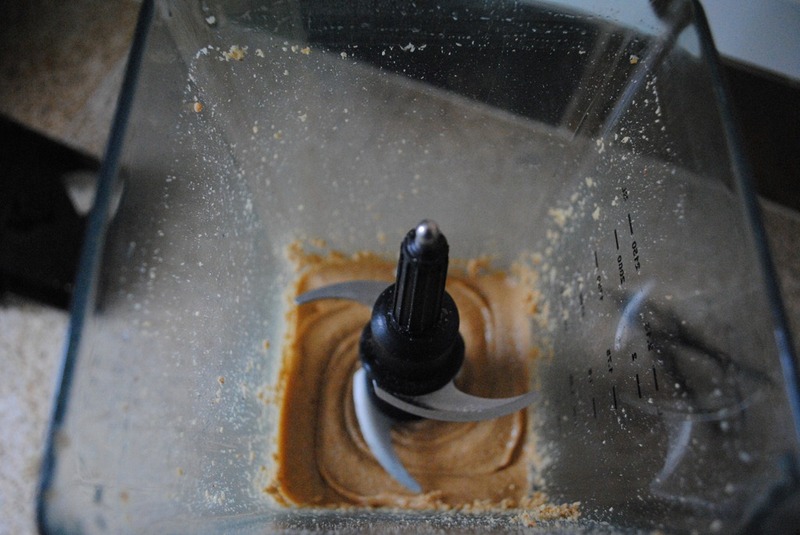 Have you made almond butter or other nut butters in the Ninja blender yet?? I haven’t tried any other nut butters yet. But, I would think the same principles apply. If you’re doing almond butter, I’d recommend definitely adding the oil, as almonds don’t seem as naturally oily as peanuts. If you do make it, please pop back by and let me know how you faired! I made walnut butter with just walnuts in my ninja 1500 last night. Took about 10 minutes for 2 cups to get the consistency I wanted. Are you still on 1 with the 1500? That is listed as dough. I just got my 1500 and I am kinda confused. With the 1 setting. I haven’t been able to make peanut butter or hazelnut butter within 3 minutes. I just end up with a very finely chopped ice cream topping consistency. I ordered the 1500 and it will be here on Thursday. I’ll give it a try when I get it and let you know. If you are not getting your nuts to blend, I would do two things: 1) add some oil and 2) try using a higher speed. Really it sounds like you need some oil more than anything – if your nuts aren’t roasted, this is likely the case! I just bought my Ninja blender yesterday to replace my broken KitchenAid blender, on the recommendation from the salesperson at Bed, Bath & Beyond. Loving it so far, and it turned out to be a good deal (especially with their 20%-off coupon — I never go there without one, they send them a couple times a month it seems). Searching the internet, I found your blog and recipes and am eager to try them, especially this one for homemade peanut butter. This household goes through a lot of Skippy each month. The Ninja does include, among the meager seven recipes in their owner’s guide, a recipe for peanut butter. They say to add 3 tablespoons of oil per cup of peanuts. Sounds pretty oily! Yours sounds better. So… what’s “a neutral oil”? I agree with you, 3 tablespoons of oil per cup of peanuts sounds pretty oily! I have made this with the oil and without, and you definitely get a creamier result with the oil. If I’m making it for sandwiches, I add oil, but if I’m making it for a recipe, I don’t add oil – just my own oddity, I guess. As far as nuetral, you could go with canola oil, vegetable oil, or even peanut oil. Personally, I use olive oil because that is pretty much all I keep on hand (which is really not “neutral” but you cannot taste it in the peanut butter). Have you tried coconut oil? It is healthy and fools your body into thinking it is protein. This helps your body not gain the weight and digests better. Thank you! I am excited to try to make peanut butter…I ordered some coconut pb from Halo-Hati…delicious and I plan on making my own and put them in small jars for next year’s christmas gifts….I appreciate this site with all of the helpful advice. Hi, I really don’t like coconut and have never tried coconut oil or milk or anything. If I add the coconut oil to the peanuts will the peanut butter taste like coconut? If so, I would have to go with vegetable oil. Thanks in advance. I would go with a neutral oil in your case. Try to stay away from vegetable oil as it has a lot of issues for health purposes, but sunflower oil, walnut oil, or even light olive oil will work! Did you use the ninja 1000 or the ninja 1100? I am trying to figure out which to buy for making peanut butter. I have the Ninja 1100. However, either would work for this. If I had to do it over again, I would buy the Ninja Kitchen system because of all the accessories and additional smaller jar that you get. I just have the 34$ ninja one from Walmart with one 48oz Blender and one smaller food processing container and it works great for peanut butter. I just add honey for tast and it helps in the creamy side of it.. My personal fav nut butter is Cashew, MMMMM!!! Hi Logan, I didn’t know there was a $34 model at Walmart – going to have to check that one out. Thanks for dropping by! I have the Nija Kitchen System 1200 and I found that the number 1 setting (dough) didn’t work well. I used setting 2 (blend) did the job perfectly. You have to, however, use a spatula after a couple of minutes to push the unblended peanuts into the mix. I used the Trader Joe’s Roasted unsalted peanuts, but I’m sure the raw ones would be good since they have no added oil. Great fresh and healthy peanut butter. Hi all, I agree with Zach I had to use the 2 button to achieve peanut butter. I added 2 tbsp of canola oil it was still pretty grainy but delish! Just got my Ninja, was so excited to try it out. Found your recipes online and peanut butter was the first thing I tried making. However, it did not work for me :(. Instead of a smooth peanut butter consistency, it came out grainy like gravel. What did I do wrong? Oh no! Grainy gravel peanut butter is no good! I have found that if you’re using peanuts that haven’t been roasted you definitely need to add a bit of oil to help everything blend together. Did you add any oil? 1-2 tablespoons of some neutral oil (melted coconut oil will make it delish) should help it all come together better. Also, turn up the speed and keep blending longer than you think you need to if it is not coming together – it will eventually become PB, but, I think the main issue here is that you probably do need to add a bit of oil. Hi, turns out it was roasted peanuts. I did add some oil (and a bit of water to get it moving) and blended on 2, which worked! Next time I will buy regular, unsalted peanuts. Do you know how long it will last since there are no preservatives in it? And BTW, thanks for posting your recipes, they look great, and I can’t wait to try them! In terms of how long it will last, it’s just like peanuts hanging out in your pantry in their original jar – the shelf life should be good if you can get it to last past a week or two. When I make it, it honestly lasts a week because we eat it so fast… But if you are concerned, you could store it in the fridge for a longer shelf life! There are essentially 3 ‘cookbooks’ that come with the ninja. The 1200 I think is the same machine as the 1100 but with the 1200 you don’t get the big cookbook. You get a couple of recipes in the owners manual and then there is a little kind of pamphlet. I recently bought the 1100 on sale at costco for under 100 bucks and it seems to perform quite well so far. We are quite happy with it. I have yet to make nut butter in the Ninja, however I do regularly make it with my cheap food processor and it turns out great. Very little oil if any is required when you use roasted nuts. The really key to me seems to be leaving it to process long enough. It seems like a very very long time so don’t give up on it. It will make a powder kind of thing that will last a while, then you should notice that it will start to clump up a bit. then it will form larger balls of stuff, then it will start to smooth out. It does take a while and it may take a little bit of oil, but it winds up being quite worth it as you can control everything that goes into it. Hi, I’ve been considering getting a Ninja Blender. Just wondering, how good is it at grinding stuff up (like rice soaked overnight)? In terms of grinding up stuff — it is a powerhouse. I can try grinding up some rice for you this week. What are you going for with the soaked rice – rice flour? Hi Angela! Thank you so much for replying! Yup, I was hoping for the consistency for rice flour. I want to make mujigae ddeok ( a type of korean rice cake) with it. Okay!~ 😀 Can’t wait for your post! Thanks!!! I use cashews and make cashew butter. It is amazing! It has a tiny bit of sweetness from the nuts themselves and you don’t have to add sugar. Delicious! Great idea, Jenni. I have used it to make cashew “cheese,” but not cashew butter. I’ll have to give it a try! Ooooohhhhh. I was so disappointed in getting the ninja until I read this!!! Looking forward to trying it! Why were you disappointed in the Ninja? I honestly love mine! I would take a Vitamix of course, but I don’t have Vitamix budget and the Ninja can do almost as many cool things (almost) at a fraction of the cost. Hopefully you enjoy making some peanut butter! Hehe I almost explained but then stopped. Well, I was disappointed because I wanted to get a juicer at first, but wasn’t so sure about the Jack LaLanne one Costco was selling. Then I saw the Ninja and I’d recalled reading good things about it…. PLUS it said “juicing” on it…so I thought “maybe…” but it’s not the kind of juicing I want. I didn’t really expect it to be, but still. Plus, then I saw all the reviews and comments from people who got Ninjas for half of what I paid. LOL Oh well. I probably just need to use it more and I’m sure I will like it. 🙂 yeah, a Vitamix isn’t in my budget either. Anyway I think I mostly just am disappointed that I didn’t try to get a deal (oh well!) and that it advertises itself as a juicer, when it isn’t really the type of juicer people are looking for. Well, that makes perfect sense. I am not a big juicer at all – though I have successfully made juice with the Ninja. It really is hard to find the exact “perfect” appliance that will do everything without having a pantry full of gadgets. Pretty much everyone that has left a comment about what they paid got a better deal on their Ninja than I did, if it makes you feel better (at least you have company)! HA! I just tried making my first peanut butter in my ninja pulse. It’s different. I don’t know if I’ll go through all of that for fresh pb again – it was kind of a pain to scoop out every last bit. Didn’t want to waste any of it ya’know! I used trader joes unsalted roasted peanuts and it DEFINITELY needed oil! I added coconut oil. It didn’t take the whole pound at once so I made two batches. My first batch I was a little chicken, and it didn’t grind to a smooth consistancy so my second batch, I really let it go longer. Much better! I will use the first batch for cookies or muffins! Anyway thanks Angela for all your advice and recipes on the ninja! Yep, it is more work, but I do really like it when I have the time. It’s nice to have the option anyway! I think I might experiment with smaller quantities in the little individual cups and see if that is better. Oh and the peanut butter was a success, even the first batch which I thought was too grainy. Now that I’m using the finished product, it might be worth the hassle. Plus I like the idea of making different flavors and other nuts. Definitely let me know how it comes out in the individual cups Debbie. I haven’t tried that! I am thinking of peanut butter cup smoothies…yum! Angela, did you ever try making the rice flour? I was reading the thread, but there was no update on the rice flour. I haven’t tried almond butter in my Ninja yet, but I have made it in my mini food processor tons of times. I use LOCAL HONEY instead of oil! Yummy and good for you!!!! Good idea, Toni! What is the ratio of almonds to honey that you use? I bet that is super tasty! I was thinking that was a good idea too! Well, that’s a little difficult to answer, but here’s what I did before the Ninja. I filled my mini food processor with almonds and pulsed until they were as fine as possible (which wasn’t very fine in it!) I added a pinch of seasalt just in case there was a little husk in there… That will take care of the bitter. Then I added honey and pulsed until it turned into a clump. I’m sorry that I don’t have proportions… Just consistencies:)) I usually used some Thomas’ double fiber low fat English muffins (which are surprisingly delisioius) to spread my almond butter on. Pop these babies in the toaster oven until bubbly, and my husband and TEENAGE son would beg for them, even after they found out how healthy they are!!!!! Ha, Toni, I totally understand! Thank you for the description, that is very helpful! And yum, English muffins and homemade almond butter! So good! I’m going to try it, thanks Toni! I might even still add a bit of coconut oil too. Okay, this is so strange. I was on my grocery shopping app, and I have peanut oil on my list, and there was a little blurb under it (I always thought they were blurbs about coupons, and usually just ignore them) but it caught my eye. Trader Joe’s peanut butter recalled. NOW I’m for sure making my own peanut butter from now on. I don’t care if I need more practice, I’ll perfect it eventually. This is getting crazy! ooh one more article I found with a lot more details. As I said I was considering buying some peanut oil to help the pb, but it looks like salmonella can hide in peanut oil. I guess I’ll be sticking to olive oil. Please research your oils before deciding for yourself which to use. There is much horror associated with canola oil. I refuse to buy anything that has it as an ingredient. It is in so much, even chocolates. I like olive oil and grapeseed oil which has no flavor. Completely agree, Pennie. I try to avoid it at all costs (AKA Rapeseed oil). In the ’90s people thought it was better than coconut oil, but the truth is coconut oil and cold pressed olive oil are the healthiest options out there. The chemicals used to create many other “vegetable oils” are scary! While I totally agree that olive oil is better than icky canola oil, you need to specifically know where your olive oil is coming from. There is a lot of fraud in olive oil imports, and you might actually be getting canola oil mixed with sunflower or even (gasp) soybean oil. I’ve been buying California Olive oil, since I don’t trust any imported oils anymore. Just wanted to mention this, since so many people are getting ripped off by the olive oil biz. That is a fantastic point, thanks Debbie, and thanks for the link. Where are you getting your CA Olive Oil? I would love to know! I like it and they are a reputable company. I’ve been buying probably about a year now. Awesome, thanks Debbie. I just checked them out online and am going to look for their oil in the grocery store this weekend. Their prices really aren’t much different from other oils with a more questionable background. Thank you! Nothing went as advertised, Luckily I was fixing to taste . . . not by recipe. When the peanuts were at the crumble stage, I added some honey — then more honey — then even more honey. Finally I got a doughy clump. Taste. Add more honey, add some salt. Repeat. Finally after more than half a honey bear, I got one pint of peanut butter. It doesn’t taste like Jif. That’s a good thing. The peanut butter is creamy, and is weeping oil, but sticks to itself better than it does a cracker. All in all a success. Better than I expected for a beginning kitchenista. I expect that pint to last a month or two. I love my NKS 1500 and use it more than any kitchen appliance with the exception of the microwave. I definitely wouldn’t add oil to your existing batch! But, next time, my recommendation would be to not add less honey and instead add oil (a healthy oil like light olive with no strong flavor) at a rate of 1 tbs per 1 cup of nuts. This will help it blend very easily. If you have the Ninja Mega 1500, I would use the food processor bowl and speed “2” – should only take you about 90 seconds to 2 minutes to complete. (I wrote this a couple years ago when I only had the Ninja Pro with the 72 ounce jar). Maybe check out my cashew butter post from last week — I even have a video in that one you can check out! Hope this helps, and good on you for learning to cook! I keep the NKS on the counter with the squat 40-oz container so it fits under the cabinet. Truth be told, I’ve never used the larger one except for Margaritas last New Years. Since I cook for one retired old fart, leftovers are usually made into Dan Salad; chicken, pork loin, or ham pulsed to chop up the big pieces; then combined with sweet pickle relish and light mayonnaise in a bowl to be stirred together. Sometimes I also add grated cheddar cheese. I can get four sandwiches at least and I don’t have to cook again until Friday. 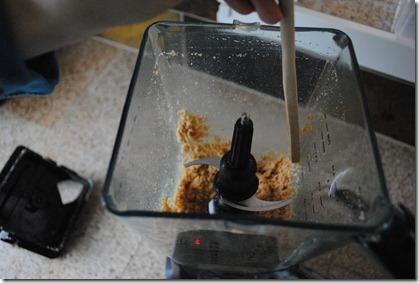 Today, I tried making peanut butter with my Ninja Pro 1100, and it did not go as I expected. Because it was my first attempt and my wife had bought Planters honey roasted peanuts, I started with one cup of peanuts in the 40 oz container. It chopped all the peanuts up into a fine powder, and piled the peanuts around the outside edge out of reach of the blades and the blades just ran over the top of a thin layer on the bottom. Based on what I read in the previous posts, I started on the 2 speed. I added 8 teaspoons of oil before it came close to the smoothness that I wanted. Does all of this sound right? What do I need to change next time? It sounds like you didn’t quite blend it long enough before adding all that oil. It needs to blend probably longer than you think it will need to, so I would recommend letting it go longer next time. Also, add the nuts + oil (if you are using) all at once, in the beginning. My general rule is no more than 1 tablespoon of oil to 1 cup of nuts. More oil will not help it blend, and you’ll just end up with an oily mess if you add more than that. When making peanut butter with the Ninja, the first thing that will happen is you’ll get a fine powder, then, it’ll start to turn into peanut butter from the inside out. You may have to scrape down the edges to blend the powder part into peanut butter for it to continue to blend. Your experience was inline with expectations — you will get it running over the thin layer on the bottom initially, before it starts making peanut butter. Blending on “2” speed is the way to go, so you were doing that right. You could even try “1”. I learned from experience that if you do “3,” you’ll never get peanut butter, as slower is better in this case. Also, I would recommend trying it in the 72 ounce pitcher and see if that helps. Sorry you had a hard go of it the first time – good luck on try #2! Thank you – it is going to be a couple of weeks before I try again, because I do have extra virgin olive oil and peanuts to dip crackers into. I’m glad I found your post. Made peanut butter in my new 1200 today and it didn’t turn out as well as i’f hoped. Took more then 20 minutes and I had a smooth peanut butter but it was dry. 🙁 I used 2 pounds in the 9 cup container, which I guess is too much, and added 4 tbsp of oil and 5 tbsp of maple syrup. Even though it’s dry it tastes really yummy. 🙂 next time I’ll use alot less peanuts. Oh no, I’m sorry to hear that! 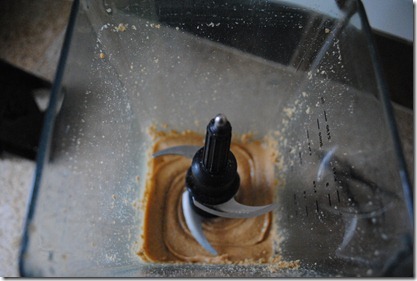 The thing with making peanut butter is you don’t want to blend it on too high of a speed – slower is better. I usually go with this formula: 1 cup peanuts, 1 tbs light olive oil, pulse to combine, then blend on “2” for about 2-3 minutes. Shouldn’t take 20 minutes! I have blended on “3” before, and it never comes together. Good luck next time! I have the ninja pulse and am experimenting with my new toy. I love cashew butter , almond butter and peanut butter so made them all with no problems at all. I also made some cashew powder, by just pulsing cashews for a few quick pulses and like to have that on top of ice cream or you can roll your finished pretzels in it for a different but yummy flavor. I am ex amish so am used to making things that may not be great for healthy eating but is delicious. Amish peanut butter is made by blending marshmallow fluff . So if you have a super sweet tooth just add the same amount of fluff as peanuts. Ex: one cup of fluff to one cup of peanuts. This way you should not have to add oil. Mary, you just provided a recipe my husband will love! I have never heard of Amish peanut butter, but I told him about it and he is ready for his batch. Thank you! what should i do if im using raw almonds? do i have to use oil? If you are using raw almonds, you’re going to want to soak them overnight and then rinse to make them easier to blend (and digest). You will definitely need oil to make almond butter, and it will take a little longer, but just keep scraping down the sides every so often and continuing to blend until you get a consistency you like. This could take 7-8 minutes, so just stay with it! I’ve got to remember to soak some almonds. Hmm we are having a blizzard here this weekend. I think I’ll soak some right now! Thanks Angela! I have used raw almonds without soaking them. I added 1 tablespoon of coconut oil and it was fantastic. I think it takes on a completely different flavor than roasted almonds. In my experience, with the roasted peanuts or almonds, there is no need to add additional oil. Adding honey or cinnamon or other healthy ingredients is a great way to sweeten/flavor without sugar. Hello again. So I made the peanuts. Great creamy texture and smooth, however it took me 6 minutes using the Ninja Mega Kitchen System. Once I hit 5 minutes (and you stated 3) I decided to go to setting 2 and it only took that last minute though on setting 2 to get that creamy smooth consistency. No certain why it took longer than the 3, but still got great peanut butter. I will say it isn’t as sweet as the store bought, but then again it is all natural. My husbands mom use to always make her own peanut butter and he stated it tasted just like mom’s. That was a complement as she is known for her wonderful Italian cooking, canning, and freezing. Just curious if others have had to use a different setting at the end and if it took 6 minutes. But love the machine….we also made the Chunky Monkey Ice Cream the same day. I presume this has to be eaten immediately or within the suggested 4 hours of freezing. I left it in the freezer for 8 hours and then it was like a block of ice…not enjoyable at that point. I will say though that the initial taste once first finished was fabulous. Will try to make it when dinner will be done within 3 hours. I’m not sure what setting you used initially, but there is definitely some variability in amount of time it takes between the settings. 1 or 2 is good for making nut butters, but 3 is too fast. It may take some adjusting to find the right speed based on the peanuts you have, which, reminds me that I should update the body copy of this post to reflect that! It sounds like you may need to blend on “2” from the get go. Glad you got a product you liked in the end, though. E making anything like this from scratch so just learning. So glad to find your site and can’t wait to try more recipes. Just started a diet or should I say life change to eating healthy so excited to get my Ninja and find this site to help. Still have 25 lbs to go. Any healthy non fat low sugar low carb ideas for the ninja? Meant to add salad dressing to the end of that post :). Congratulations on your health journey! If you don’t already read her blog, this is one to add to your list. Lots of healthy and simple foods. Hello–is there any danger of burning out the motor on a Ninja 1100 when making almond butter? We just bought our Ninja and set to making almond butter right away. Because we had burned our other food processor making almond butter I think we were extra on edge about it so I kept turning off the Ninja to let it “rest.” We did this also because I smelled an electrical odor (but this may have been just a “new appliance” smell). I am also reading in this thread that nut butters should use speed 2 and we were using 3 the whole time. 2) Be sure to add oil to the almonds to help them blend – 1 tbs oil to 1 cup of almonds is my general rule. The Ninja does best with volume due to the size of the jar and the design of the blades, so I would recommend a minimum of 2 cups of almonds. 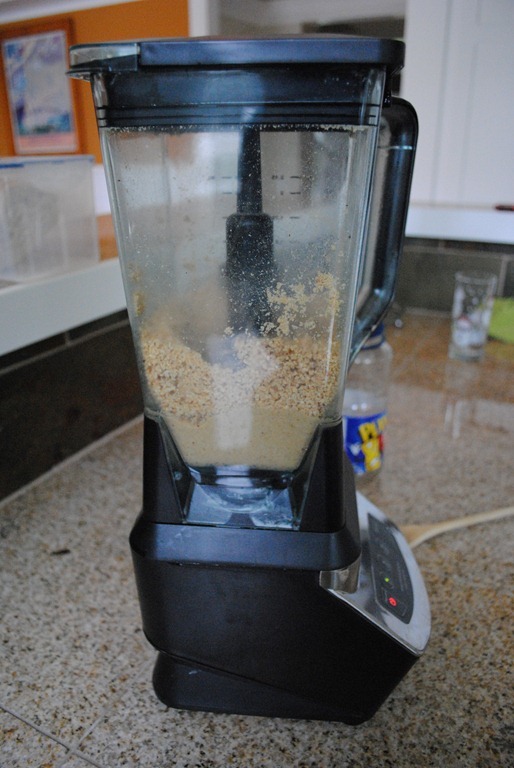 For nut butters, I typically start by pulsing a few times to get the mixture going, then use speed 2 (and sometimes even 1), as speed 3 just chops up the nuts and doesn’t fully blend them in my experience. If you are blending and not getting anywhere, lower the speed. You definitely don’t want to smell any kind of electrical odor – that is not good! Almond butter is the hardest of the nut butters to make, and takes a lot time (usually around ~10 minutes in the Ninja), so I definitely understand your concern. If you soak the nuts beforehand, add the oil, and blend on 2 instead of 3, you should be just fine. I have made a ton of crazy stuff in the Ninja Professional Blender and it is still going strong, so as long as you exercise caution and turn it off (like you did) if you smell anything odd, you should be fine. First butter I made was almond butter with my daughter. She had so much fun… And, she’s 19. Thanks Angela and Nana Vi! I have just got my ninja and am looking forward to making all kinds of peanut butters. Have tried rice in my blender and it turned out fine read to use. Also did oatmeal for flour in the blender it was great. Am trying to eat healthier because I am 74 and now I would like to live a better life. LOL. I loved all the comments and will go back and download some of the recipes. Thank you all. My peanut butter is really runny. I didn’t see your recipe until after the fact. I’m sure I used the high setting. Will it solve the problem by using the low setting? It’s still REALLY good though, but so very runny. Pop it in the fridge and it will thicken up some. What was your ratio to nuts/oil? That could have something to do with why it is runny. I didn’t add any oil to my nuts – just nuts. How nutty is that? 🙂 haha:) I’ll try putting it in the fridge. I tried this last night in my new Ninja Mega Kitchen system. I used the 24 ounce bowl. It didn’t work. I used 2 cups of unsalted peanuts, two tablespoons of oil and two tablespoons of honey. I blended it for 6 minutes on 2 and it never would get creamy. My family hated the taste and texture. Any suggestions on what I can do next time? I soaked the peanuts but I only had time to let them soak for an hour. I downloaded Angela’s book from Amazon and it said you should soak the nuts you are using for four hours and rinse them prior to using them. I will try it without soaking them then. Thanks! So sorry for the confusion! Peanuts do not need to be soaked because they are legumes. Almonds, cashews, etc will do better if you soak them. It should work much better for you without soaking! 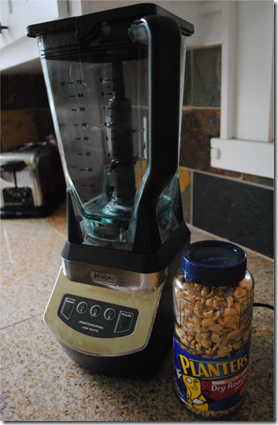 I just made peanut butter using the Ninja before reading your blog. I saw a YouTube video of it. I pressed 3 and it took less than 5 minutes. My boyfriend said it tasted just like the store brand! than just your articles? Imean, what yyou say is valuable and everything. with pics and videos, this blog could undeniably be one of the most beneficial in its field. Thanks for the recipe! Worked great. FYI lasts up to two months in the fridge if any of you are wanting a longer “shelf life”. If you order directly from Ninja, which I did, you can get the 72 oz. 1500 with food processor attachments and bowl, prep bowl and the 2 individual cups, for $179 and 5 year warranty. Thanks for the tips Angela. Just made peanut butter with oil and honey, came out great. Do you have a recipe for peanut butter cup smoothie? Thanks in advance. Glad it worked out for you, Chuck. I don’t have a peanut butter cup smoothie recipe, but that is a good idea! I will get to work on one. In the meantime, I do have two things for you, that are somewhat but not totally related. I know im late into the game here. I love peanut butter & find sometimes its cheaper to buy at store do to the high price of nuts. I am vegetarian & peanu tbutter is like a go to food for me. Grab a spoon, take off lid, endulge. How simple can it be. 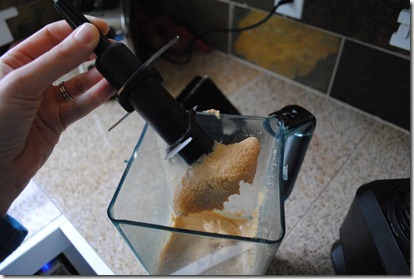 Has anyone used the Ninja Storm Blender o make PB? I would assume it would be same process as above. What threw me off in this article is that it says if you are using a food processor it takes longer to make & seems messier. I woulda thunk the opposite. I think the Ninja Storm is considered a food processor, but idk.